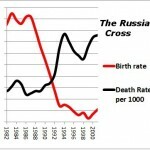 As little as a few months ago, alarmist commentators were forecasting Russia’s demographic doom. They predicted a wave of abortions that would strip down its post-2006 fertility gains, and a prolonged period of fertility postponement that would have longterm effects deep into its dark Putinist future. 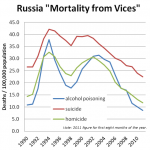 Meanwhile, there would be a renewed pandemic of vodka binge drinking that would further exacerbate Russia’s already lamentable mortality rates. 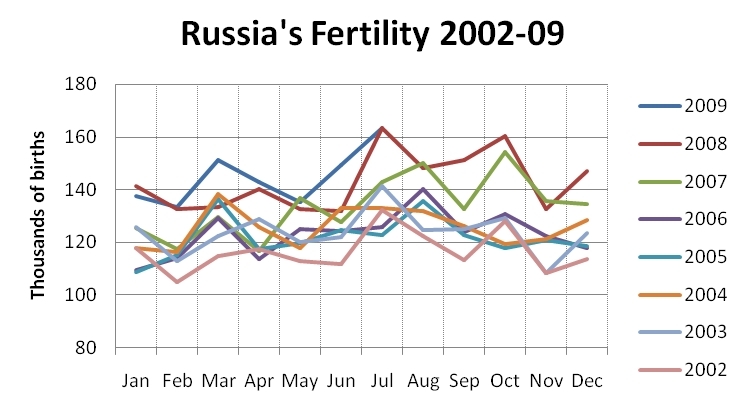 My April prediction that “the probability that the crisis will have a significant longterm effect on Russian fertility is extremely low” and my May prediction of a “a birth rate of 11.5 / 1000 and a death rate of 14.5 / 1000 this year, changed from 12.1 / 1000 and 14.8 / 1000 in 2008” were dismissed and ridiculed by some (not by everyone though!). To put it bluntly, they were wrong. In the first half of 2009 (H1), birth rates increased by 4.2% and death rates decreased by 4.0%, which gives a birth rate of 12.6 / 1000 and 14.0 / 1000 for the rest of the year if linearly extrapolated – better even than the “optimistic” variants of my estimates, which are themselves regarded as optimistic by the general commentariat! That is almost certainly not going to happen, because there would have been some fertility postponement during the peak of the crisis (October 2008-March 2009), which means that Q4 is going to be perhaps 5-10% lower than last year. 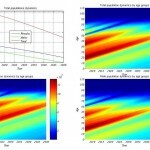 Overall, though, it is reasonably to assume that total births in 2009 will be the same as in 2008, whereas mortality rates are going to continue on their secular decline (in particular, it is telling that deaths from alcohol poisoning fell by 17% in H2 2009 relative to the previous year!, in stark contrast to predictions of mass drunkenness by the new unemployed). I am reproducing here a very informative essay and data compilation by Sergei Slobodyan of the Untimely Thoughts discussion group – Latest Population Trends – Jan to July, who brings us the latest on this issue. 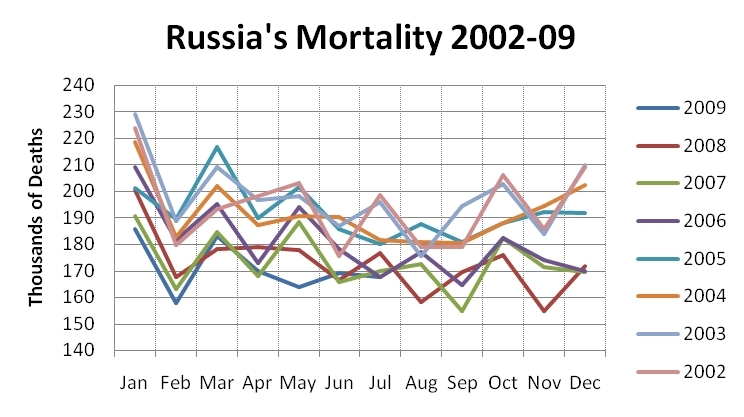 The data I’m using comes from Goscomstat’s advance estimates on fertility and mortality, reported every year cumulatively, which I turn into monthly data. There is a more precise estimate of total deaths and births for annual numbers, but there’s no obvious way of getting this precise estimate at monthly frequencies. In the last couple of years, the difference between the two estimates is very small for deaths but births could be underestimated in advance statistics by up to 8 thousand per year. I then pass the monthly series since 2002 (the year the data starts being available electronically) expressed in terms of births and deaths per day through seasonal adjustment software, namely DEMETRA using Tramo-seats method. Attached table shows my raw data, and a graph with the original and estimated trend components. There are also forecasts for the next 24 months. [Click image for larger version]. The 2009 data from January to July tells two stories. First, both fertility and mortality continue almost exactly along their 2008 trends: mortality restarted decline in 2008 after a virtual stop in 2007, and fertility started to grow at a rate that’s somewhat lower than that observed in 2007. Seven months of 2009 is not long enough to speak about presence or absence of trend breaks, but a large change would have been visible. As it is, trend mortality drops at about 3.5%/year rate, and fertility grows at a 4 to 4.5%/year rate. Second, usual seasonal patterns continue showing up: summer births spree started early this year (in June, instead of July-August), but even the July numbers are essentially the same as in July 2008. Mortality exhibits a usual summer drop; the minimum is usually observed in July to September, it looks like this year the minimum is yet to come. Do we observe any evidence of the “abortion epidemics” that scared everyone in March of this year (see JRL #173, 1)? Hardly. In almost every month of 2009, number of births was either higher than in 2008 or essentially the same (it was lower in January). There is no discernible change in this pattern for May, June, or July, even though children born in these months could have been legally aborted after onset of the crisis was widely announced (“term”, or 38-week early July births could have been aborted until about New Year, for example. Late July or premature births could have been terminated in January or even later). Thus, either the “abortion epidemics” as reported did not happen, or before it we were poised for an even stronger than usual summer birth season that was prevented by the crisis. In the latter case, most of these births would surely show up in 2010. August data point would allow answering the question even more precisely. What can we expect for the 2009 total numbers? I would be extremely surprised if some forecasts of significant birth losses come true in the year 2009: for example, to have 1600 thousand births for the whole of 2009 (110,000 or so less than in 2008), monthly fertility for the remainder of 2009 would need to drop from about 145,000 currently to 120,000, a number which was last observed in early 2006. The year 2010 is still uncertain, and delayed fertility, rather than abortions, is likely to play a large role in fertility numbers there. But, unless the feared “second wave” of crisis materializes, we are hardly likely to see a number noticeably different from that of 2008. Finally, what can my technical analysis say about the month when fertility is going to beat mortality? In July 2009, natural population growth in Novosibirsk region was positive – for the first time in 18 years. When can we expect this to happen for the whole of Russia? With current trends, expect this to happen at some point next summer. 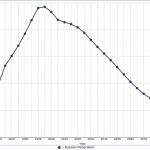 Trend mortality is projected to get below trend fertility in the summer of 2011. If the natural population growth behaves this way and if current migration patterns hold, positive population growth in summer months of 2010 for the Russia as whole is possible if not probable.